We have a big yellow lab, who when born was the runt of the litter and is now at only 3 years old is far bigger than most lab dogs. 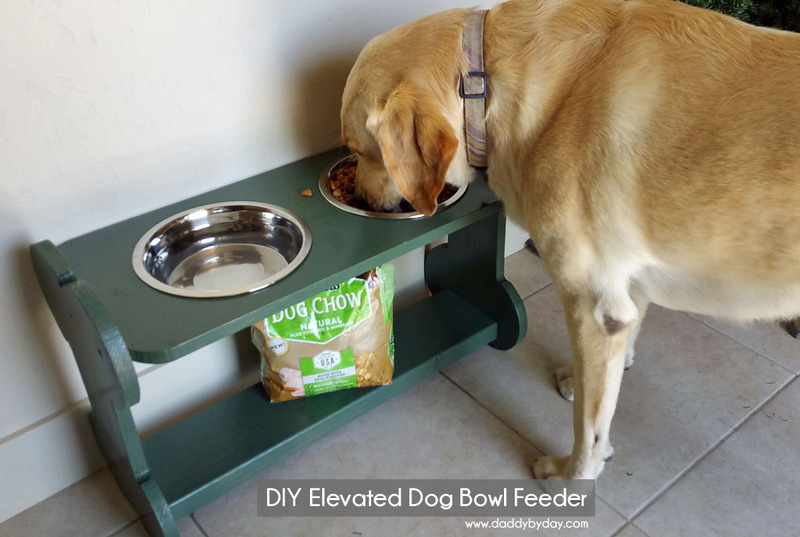 For this reason we have decided to make him an elevated dog bowl feeder so that he can be more comfortable when he eats his Purina® Dog Chow® Natural dog food. 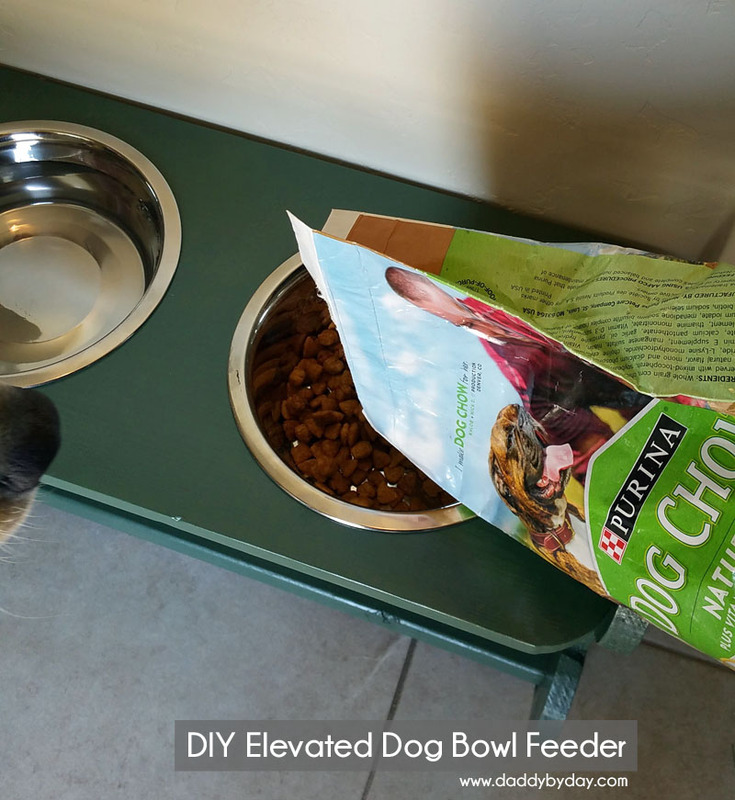 We choose Purina® Dog Chow® Natural dog food because it is made with real chicken and features 23 essential vitamins and minerals our dog needs. 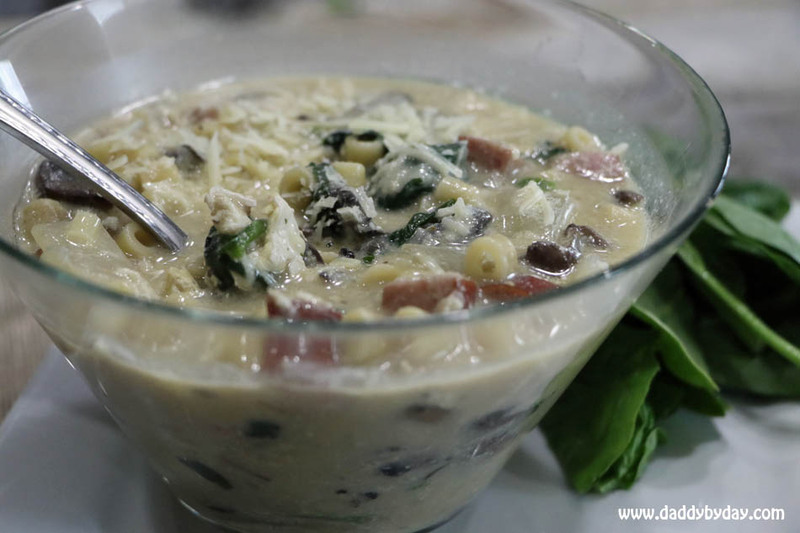 It is also a quality dog food at an affordable price which is good for us and our big family. 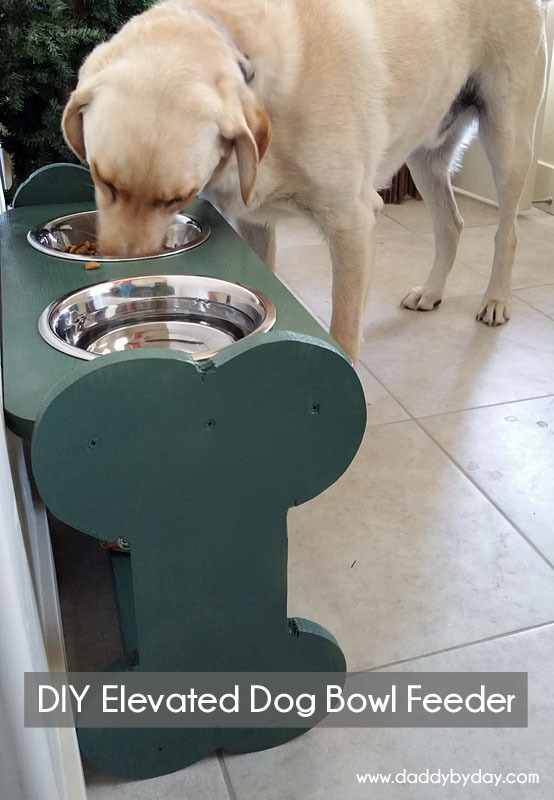 We know our dog is eating good. NOTE: Make sure the boards are not warped. 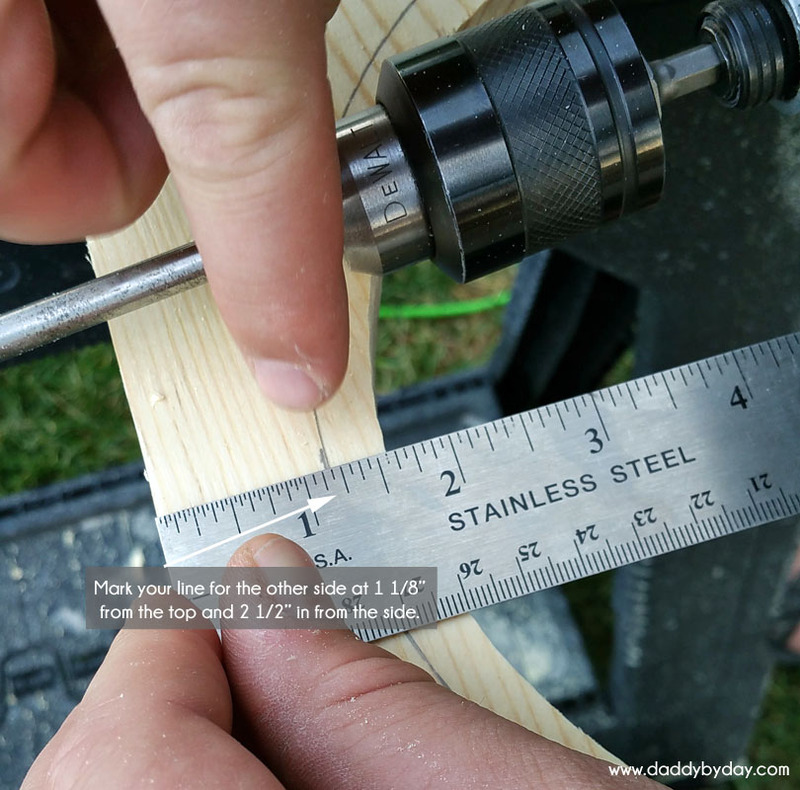 Otherwise your cuts won’t line up correctly and the pressure from trying to get them to fit could cause your wood to split when you put in the screws. 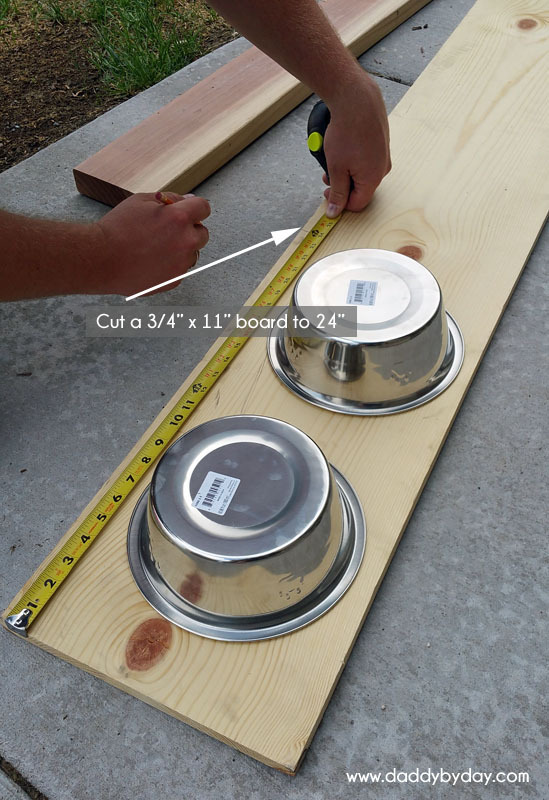 Take the 3/4″ x 11″ x 24″ board and mark where you are going to cut the holes to put the bowls in. 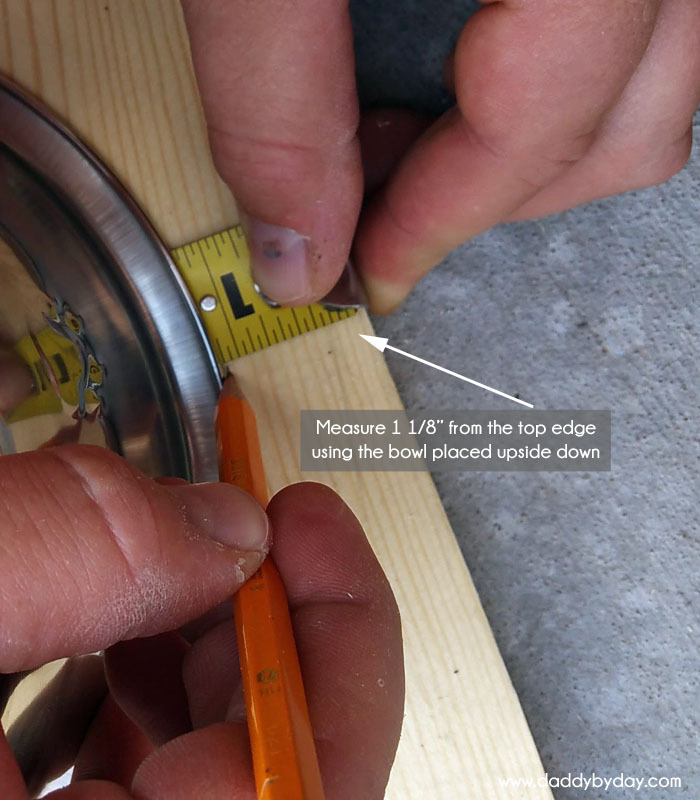 We measured 2 1/2″ from each edge lengthwise and 1 1/2″ from each edge width wise. 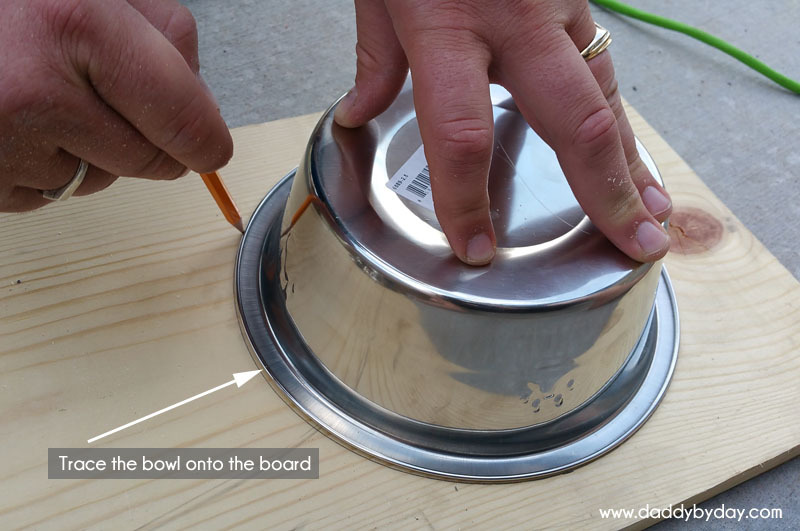 Once you have your marks, trace the bowl placed upside down on the board. 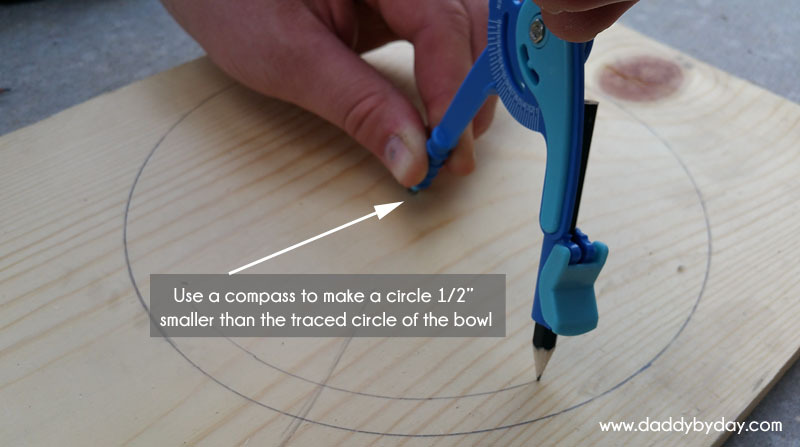 Measure 1/2″ in and make a small mark and then use the compass to draw a complete circle 1/2″ smaller than the size of the bowl. 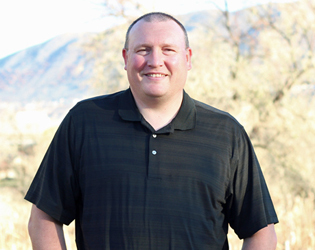 This will be your cut line. 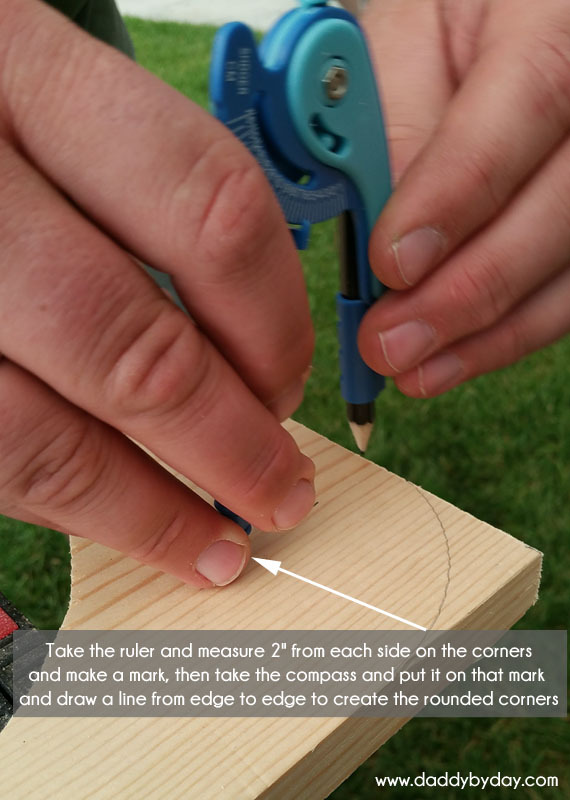 Before you start cutting you are going to take your drill and use the 5/8″ daredevil spade bit to make a small circle right on the border of where you will cut. 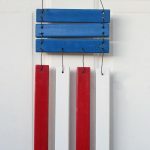 This will allow you to get the blade of the Jigsaw in position and keep the integrity of the board. 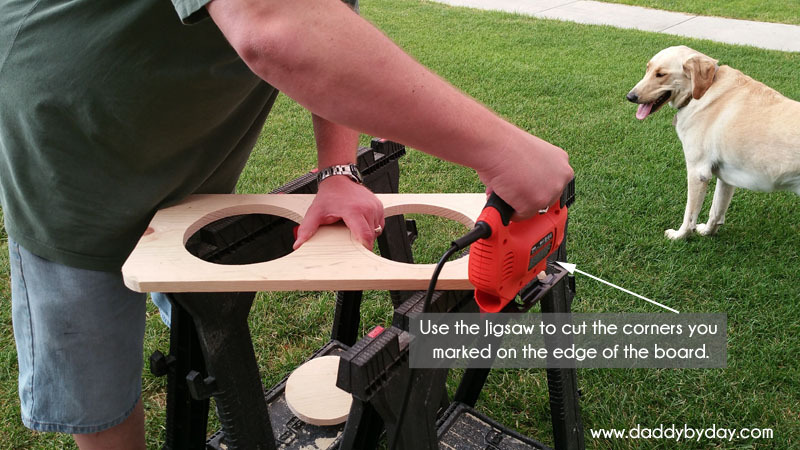 Cut the first hole and then use the piece you cut to trace the other bowl pattern. 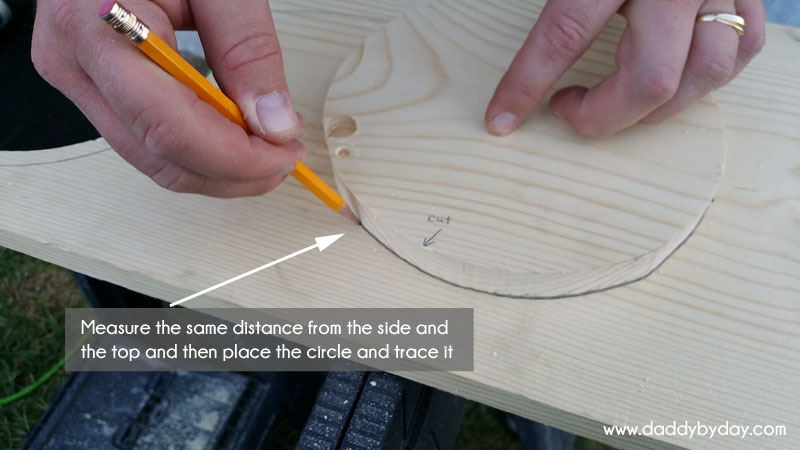 Measure the same distance from the side and the top and then place the circle and trace it. 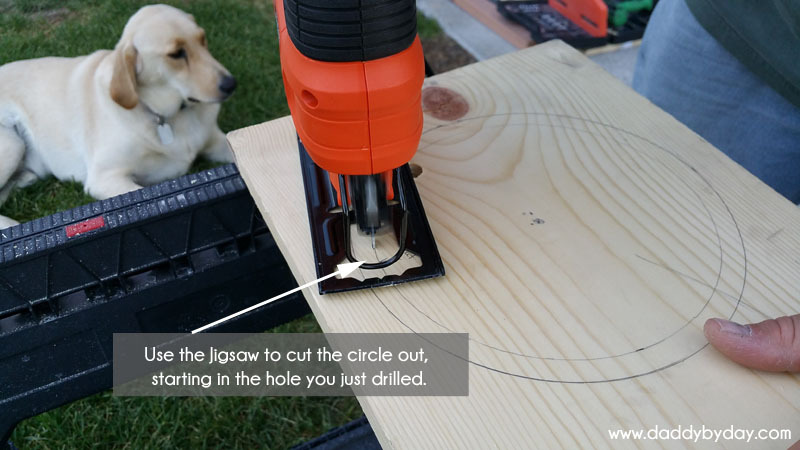 Cut this circle as well. 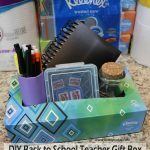 After you have the circles cut, take the ruler and measure 2″ from each side on the corners and make a mark, then take the compass and put it on that mark and draw a line from edge to edge to create the rounded corners. 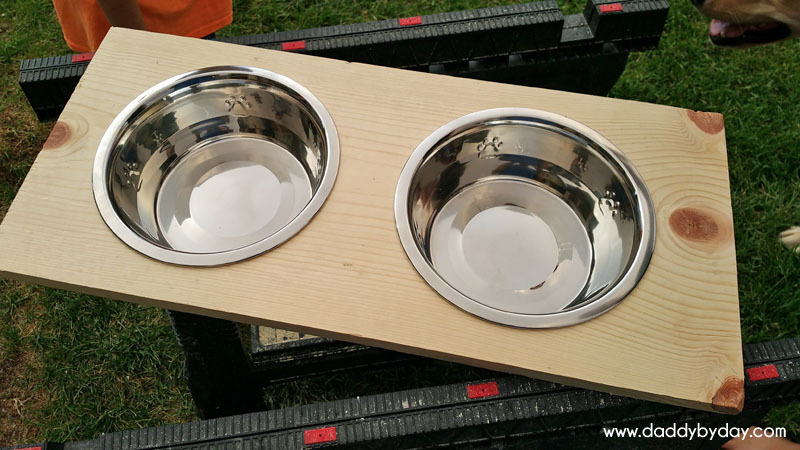 Once you have the circles and the corners cut, you will want to go onto the dog bone side boards. I drew these free hand. I did one, cut it out and then traced it so they both look the same. 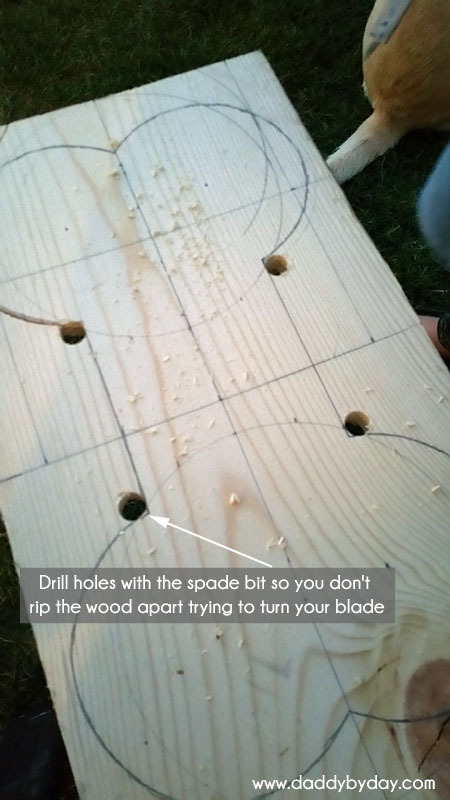 In order to do the corners you will want to drill holes with the spade bit so you don’t rip the wood apart trying to turn your blade. 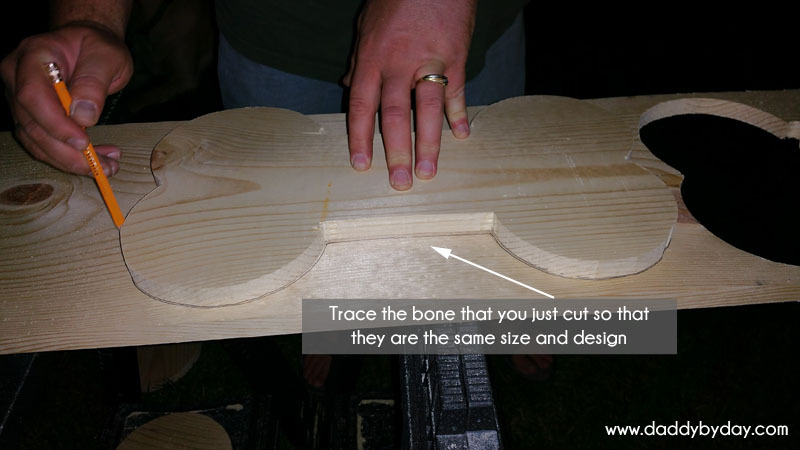 You could also use a scroll saw for these cuts. 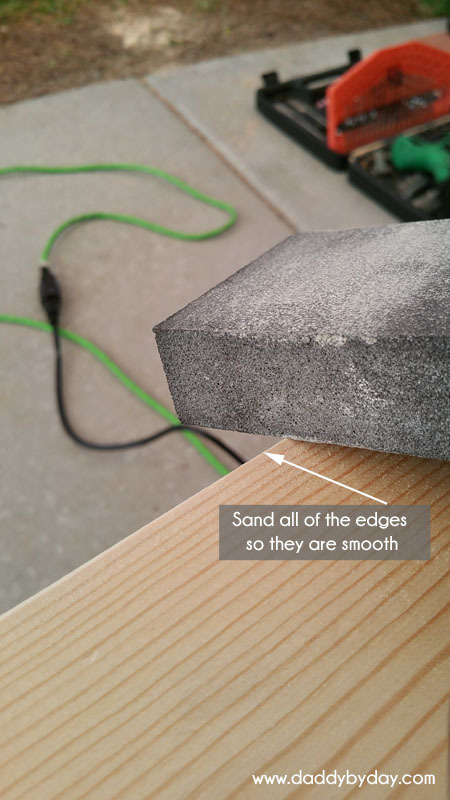 Once all of the cuts are made, take a sanding block and smooth all of the edges and make sure everything is smooth. 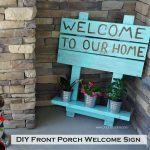 Once you have the boards ready, you will mark them so they can be screwed together. For the bottom support board you will mark 1 in from the bottom and center it from each side and trace around the board. 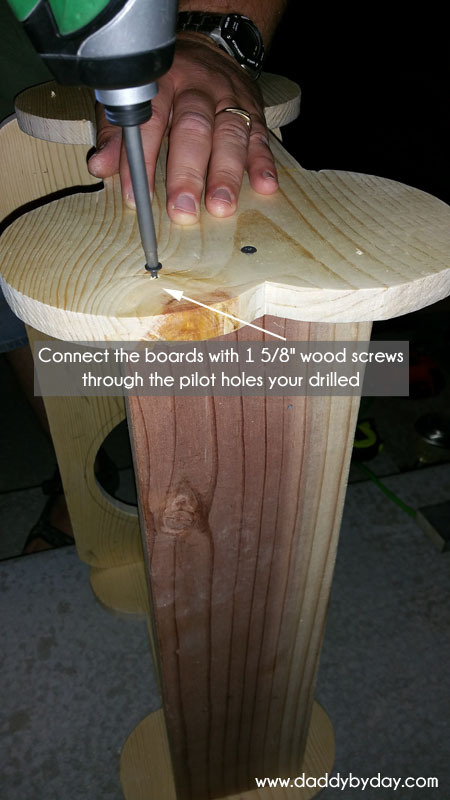 You will use a small bit and drill three pilot holes for the screws. Do this on both boards. 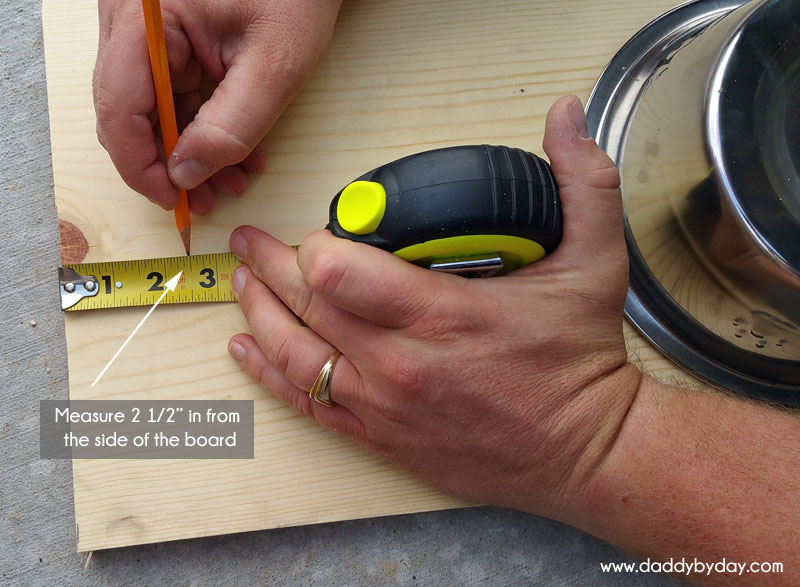 Next you will measure the top board (with the two holes cut out). 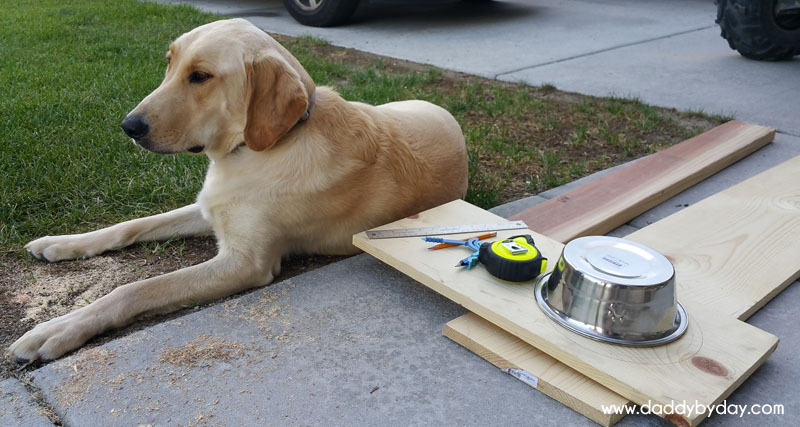 Measure 2″ down from the top of the dog bone boards and evenly in the middle of those marks, drill three pilot holes where you will attach the boards together. 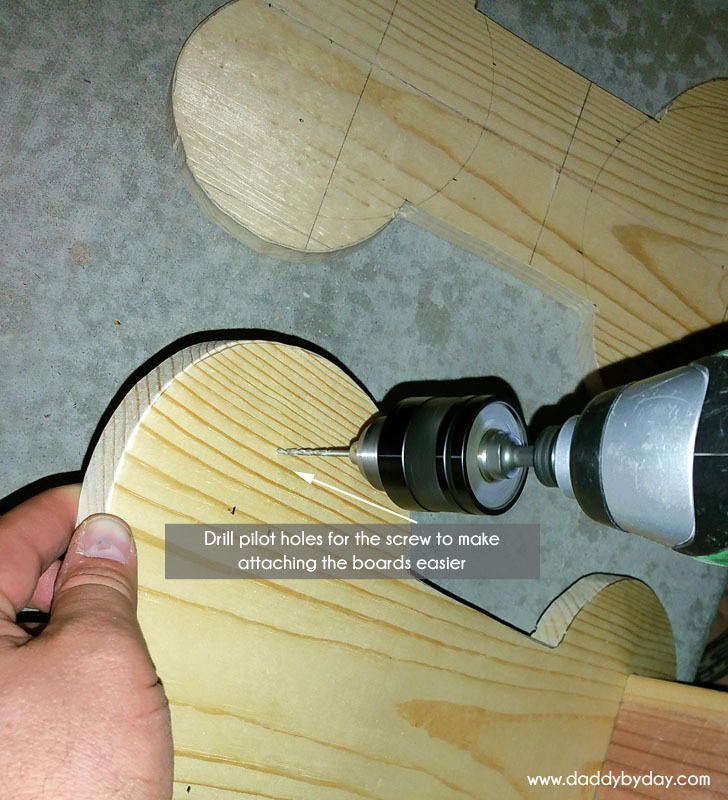 Once all of the pilot holes are drilled, start assembling the boards.When you are finished you will want to paint it. 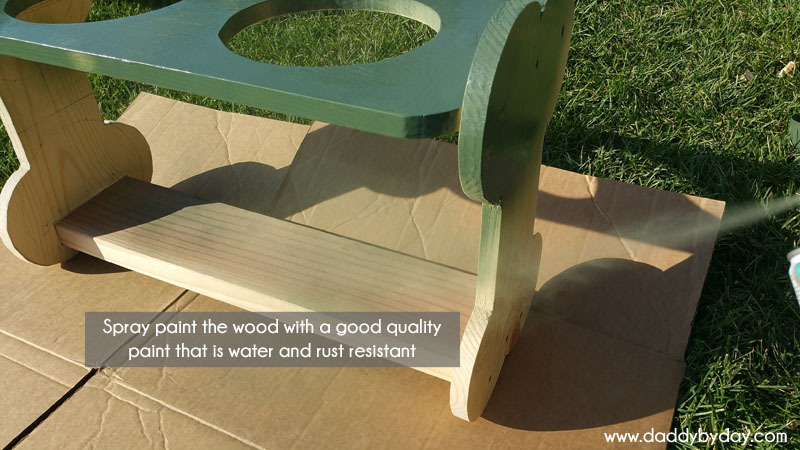 We got a quality water and rust resistant spray paint and spray painted the whole thing green. I think it turned out great! 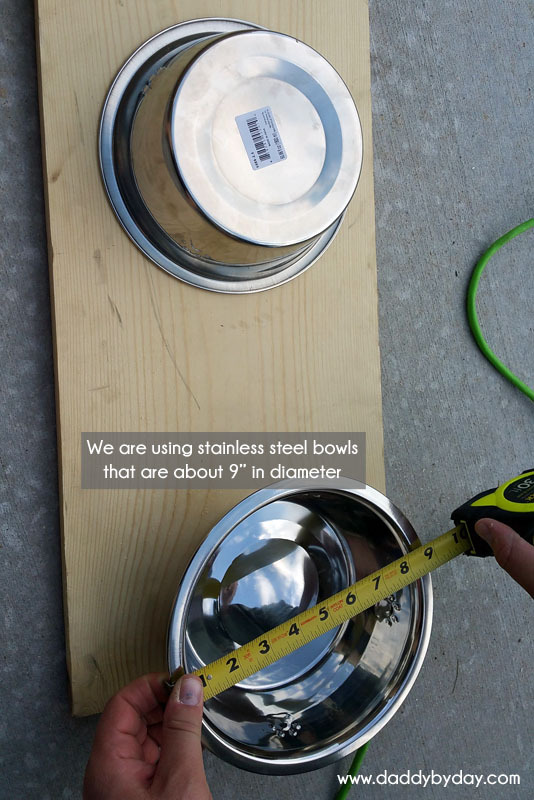 We made it a custom height for our dog, so you will want to measure it with your dog to ensure that it is not too high or too low. 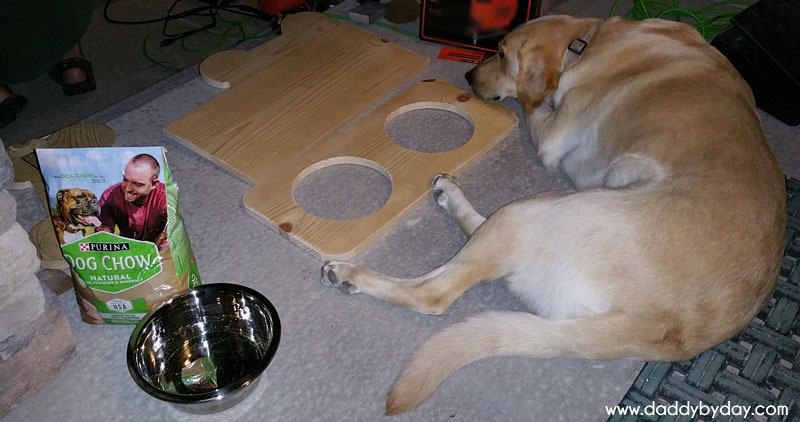 The bottom support board is important and it makes a nice shelf for you to store the food on. 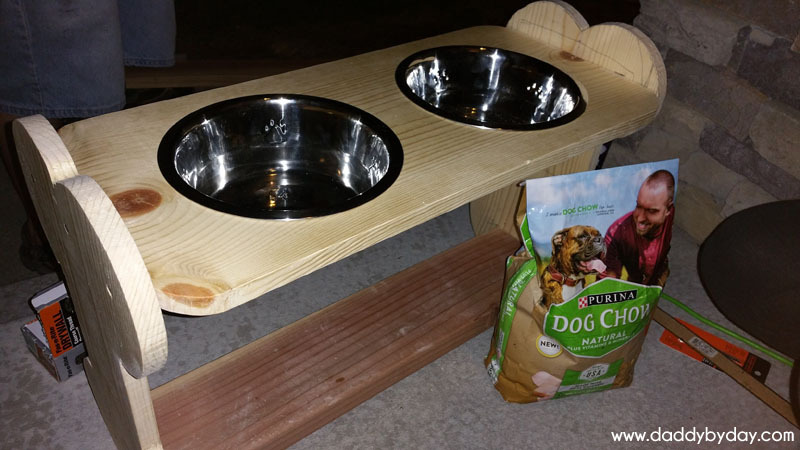 We pick up the Purina® Dog Chow® Natural at Kroger while we are getting our food, we get our dogs. 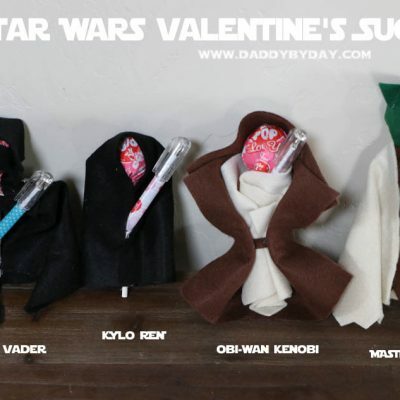 He loves the taste and I love how good it is for him. 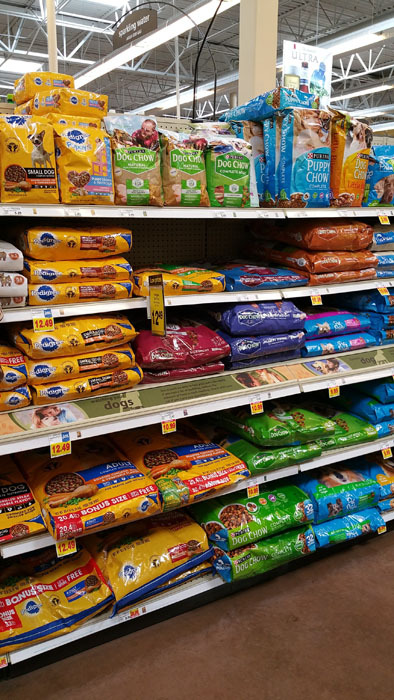 Right now you can get a digital coupon for $2 off Dog Chow Naturals dry dog food, $1 Off Tidy Cats Lightweight Litter, $1 Off Tidy Cats Litter. 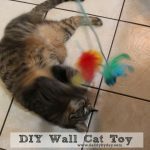 Click here to download your Purina® and Tidy Cat coupons now. 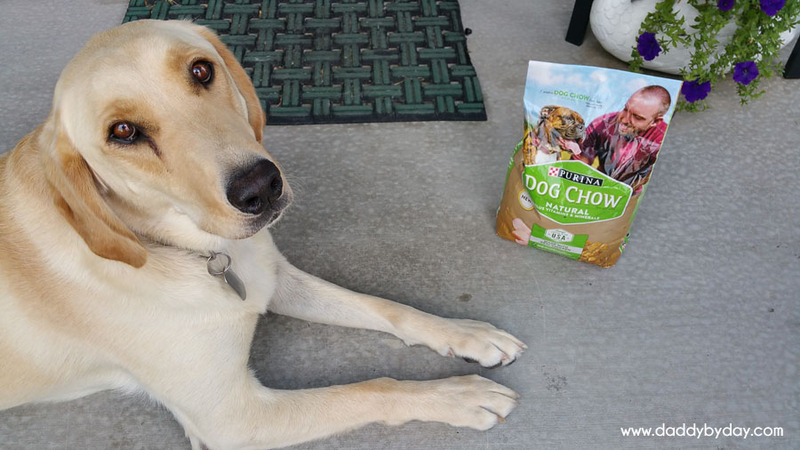 Purina® Dog Chow® Natural features more than 21g of protein per cup – for lean, strong muscles. 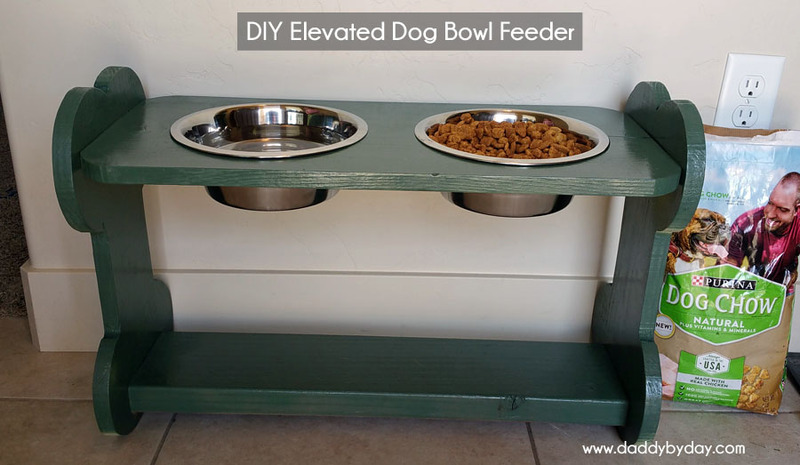 Let us know how your DIY Elevated Dog Bowl Feeder turns out and be sure to pick up some Purina® Dog Chow® Natural at Kroger. 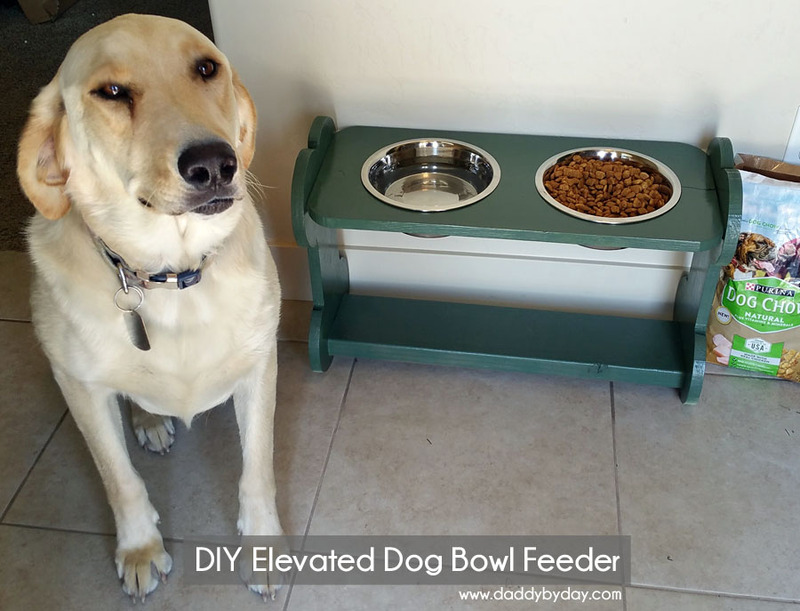 Your dog will love it.